Shout Outs are a great way for users to communicate with your community, by posting information on their Portal Profile, which other members can view and interact with. Log into your account by going to the Portal address and entering your credentials. The posting section on your account homepage allows you to post either Status Updates or Shout Outs. Select Shout Out to conitnue. Enter your desired text, then click Post. Your post will now be displayed below, under the Recent Activity section. To reply to an already posted Shout Out (this can either be yours or someone else's), all you need to do is enter your text in the "Email a Reply" under the Shout Out, then click Reply when you are ready to send your reply. 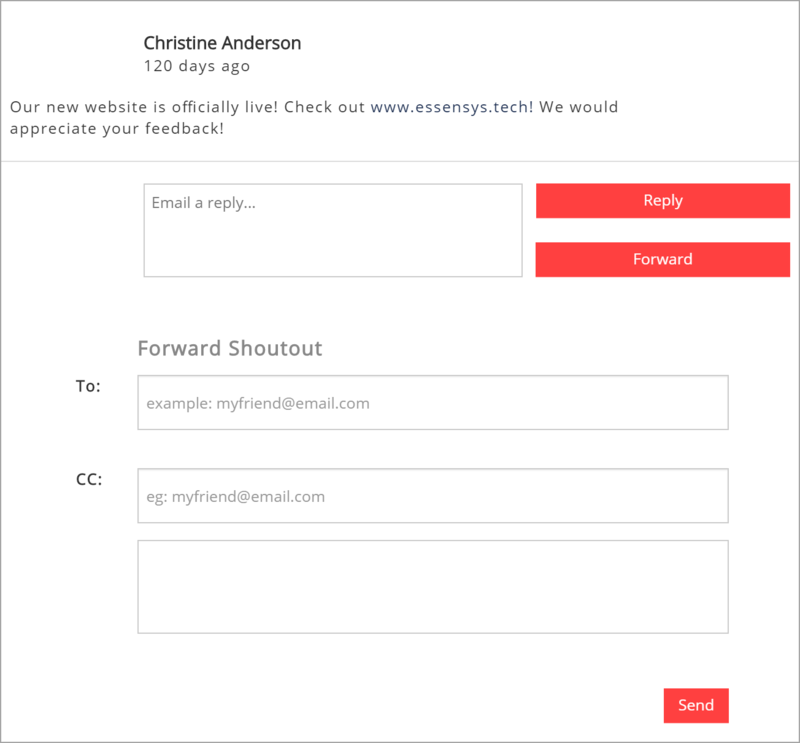 This will send an email to the Shout Out poster, informing them about your reply. This feature allows you to send a particular Shout Out, posted on the Member Portal, to an external email address. To do this, click the Forward button below the Shout Out you want to send. Next, the Portal will give you the option to add the email address to which you would like to forward the Shout Out; as well as a CC option, if you would like to send to several people in one go. Enter an email addresses under the To and CC fields, then copy and paste the Shout Out message in the field below - you can also customize this to add additional content. Click Send when you are ready. You can see all the Shout Outs being posted on your Portal in Operate is by going to the main menu, then to Portal > Shout Outs. Recent Shout Outs are shown by default, but you can change to view All by selecting 'All' from the View picklist. (You can make your own View with your own filters by clicking on the "+" icon next to the view - learn more here). To see all details of the Shout Out, click on the Contact Name to open it. 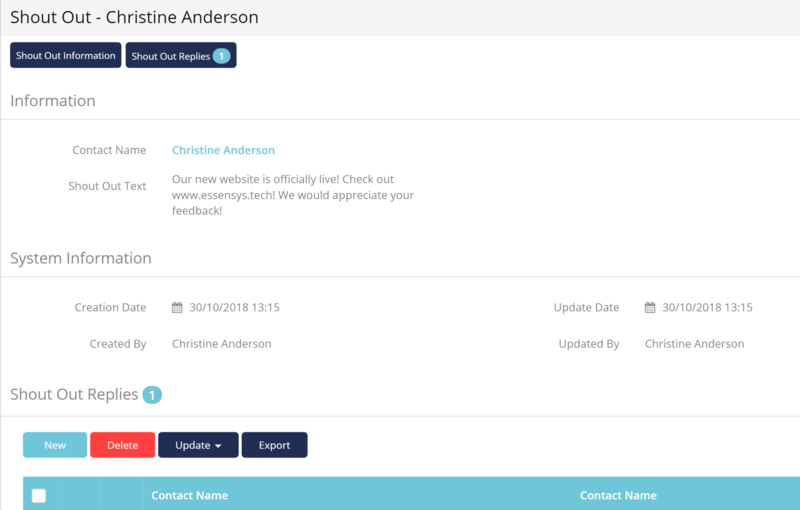 Operate then displays the details of the selected Shout Out, as well as any replies sent to it. You can also look at a Contact Record, and see all Shout Outs by that Contact listed in the Shout Outs related list if it is on your Contact Page Layout. Community Shout Out Forward - This is sent along with any forwarded Shout Out. Community Shout Out Reply - This template is sent to Shout Out posters, when someone replies to them; along with the reply. New Community Shout Out - This is sent to all Portal users who have opted to receive Shout Out notifications. Each of the above mentioned templates can be edited, using the green pencil icons next to them. Learn more about editing email templates. Make sure you enter a valid 'From' address that the emails will be sent 'from'. You do not need to enter a 'To' email. The Portal will send the emails to the Community members that you specify when you create your Shout Out (My Network, My Building, My Region or All). Don't forget to give your email a subject! Create your email template using the available merge fields and the editing tools. Select a merge field that you want to use from the picklist, then copy and paste the Merge Field Value into the template wherever you want it to appear. When the email is sent to a Portal user, the merge fields will be replaced by user specific information which Operate pulls from their Contact records. Save the template when you are happy with it. Portal users can opt out of receiving email notifications for Shout Outs by editing their Portal Profile. To do this, log into the Portal and hover over the user name. then select Privacy Settings. Untick the option to 'Receive Shoutout Emails' and then Save the change to stop receiving Shout Out email notifications. As an Operator, you can decide who receives Portal Shout Outs by default. You can choose to send Shout Outs either to everyone in the building or to the sender's followers only. In Operate, go to Settings > General > Portal > Portal Community. My Network to send Shout Outs to the sender's followers only. All members to send to all users in the building.